The Most Popular Financial Markets Analysis of 2013 - Stocks Stealth Bull Market Raged On! The stock market surged higher into the end of 2013 to close well above Dow 16,000 at 16,576, a whopping gain of 26.5% for the year! This for a year that contained widespread repeated calls of not only why the stock market could NOT rise during 2013 but also that a stock market crash was always imminent, just as had been for virtually the whole of 2012. But don't worry, there will be plenty more cliff-hanger events during 2014 to illicit even more intense perma bear mantra such as the return of the U.S. debt ceiling crisis. I last laid out a road map for my stock market expectations into March 2014 during early November 2013 - Stock Market Forecast 2014 Crash or Rally? Drone Wars and the Nuclear Apocalypse. The stock market is running significantly beyond my expectations which therefore offers much opportunity for volatility during January as the market continues to meander its way towards my target of 17,000 by early March 2014. Which I am sure will give the bears many more opportunities to be crucified! Whilst I will come back to the stock market periodically during 2014, my analysis going into 2014 is wholly focused on the housing markets as I see this as the year Britain will be transformed once more from fear to greed as housing mania grips the nation. Don't get me wrong by confusing what I deem to be the most probable outcome against what I would consider to be in the best interests of the people of Britain for all that the housing bull market will deliver is to entice people to get into even more debt as they are encouraged to borrow what they will not be able to service when interest rates rise, for if we have learned one lesson from the financial crisis than it is that the banking crime syndicate that controls Britain NEVER LOSES! They want to convert everyone into a debt slave and a housing bull market is just what they need for people to be once more brainwashed into borrowing, for instance thinking that equity release for consumption of chinese junk is capitalising on the rise in the value of their homes when in reality it is just amounts to an INCREASE IN DEBT that the debt slaves will have to service from future wages that has nothing to do with their property values! Do subscribe to my FREE newsletter for in-depth and detailed trend forecasts during 2014 and for access to download my latest ebook which will be available for download within a couple of weeks. Let's look at why gold will hit $2,500 within 12 months. A crash in prices can render many of the world's gold miners unprofitable overnight, which is what happened earlier this year. Many cannot afford to mine gold below $1,250. The truth is, some well-known global gold producers are facing the possibility of having to close down a number of their operations right now. That's putting a huge damper on gold mining in 2013. And that stands in stark contrast to what's happening in global gold demand. The stock market wants to trade at a new all time high (14,164) and is fighting hard to do so against strong technical resistance that call for an increasingly severe correction. Therefore I am timing the correction to begin after the New All time high, though in reality it could take place at anytime. The quality of the correction will likely be severe and extend for several months into late Summer that would set the scene for an strong end of year rally that will likely carry the Stock market to a new all time high. At this point the analysis resolves to a new high of around 14,500. In summary this analysis concludes in a detailed trend forecast for the Dow to target a correction into Late Summer of 12,500 to be followed by a strong trend to a new all time high of 14,500 probably during Early January 2014, as illustrated by the below graph. It's Christmas! That means a month long media induced buying frenzy for the masses to engage in as sales fever pitch reaches its maximum intensity in the run up to Boxing Day. However, a word of caution as this is NOT 2008 when many retailers were teetering on the edge of bankruptcy that would claim many such as Woolworth's and Comet, and thus were panicked into real deep discounts to quickly offload stock to improve their cash-flows. Instead, now we have a strong UK economic recovery underway that is resulting in an highly engineered sales season which started off with over inflated prices calculated to generated discounts of as much as 75% so that items can still be sold for a hefty profit. With an astronomic and ever growing debt and derivatives overhang, there are essentially only two choices for the world economy. One is to deal with it head on, which would trigger a deflationary implosion that would create an economic wasteland leading to anarchy, riots and revolution etc. Quite clearly nobody wants that, least of all those in power. So that only leaves one other option, which is to keep things limping along for as long as possible by clamping interest rates at zero to stop debt compounding and to print whatever quantity of money is required to keep the status quo going. The big difference between now and 2008 is that this is now a truly global strategy with the WWEW, the World Wide Elite Web, now controlling and directing a coordinated campaign of liquidity enhancement to achieve this objective. For evidence of this you need look no further than the Fed delivering boatloads of newly created cash to the European Union to prop up its banks, or to Japan suddenly abandoning decades of deflationary policy to get with the plan, which is why the yen has collapsed. However, the Fed's generosity towards Europe may not extend to saving the euro, which US elites may view as a nuisance because it potentially undermines the dollar's reserve currency status. I bought a copy of USA Today Weekend at the supermarket and wanted to gag. A front-page lead story showing a picture of Edward Snowden's Russian permit was titled: "Welcome, Comrade Snowden" (Is John McCain now writing their headlines?). To read American mainstream news is to collide with an illusory but impenetrable wall of rigid propaganda (rah, rah, America #1; rah, rah, S&P 1700; rah, rah, Washington vs. a world of enemies). In short, the paper's almost one-million readers were encouraged. In so many words, "Don't worry about NSA. Congress has heard the American people and is now moving to reform it. Sleep well tonight, Senator Patrick Leahy is awake." According to Rogers gold prices have even further to fall. "I have repeatedly babbled about $1200-1300/oz., but that is just because that would be a 30-35% correction which is normal in markets," he told Business Insider this week. "But I am a hopeless market timer/trader." ■India raised its gold import tax from 4% to 6%, which has limited the demand for gold in the world's largest market for the metal. ■Technical analysts and chartists have been arguing that prices would fall. ■The collapse of the Bitcoin over the past two weeks coincides with many of the digital currency's owners also owning gold. ■Finally, Rogers believes Germany's demand that Cyprus sell part of its holdings in gold to alleviate debt concerns added to the sell-off. 8. Japan Hyper QE Inflation Wars, Bank of England's Bail-in Secret, Buy Gold, Silver? Since Japan started quantitative easing off some 20 years ago so it should not come as any surprise that it's latest mega-money printing actions could be termed as 'Hyper QE' which illustrates the global inflation mega-trend in progress as it goes that step further than those in the West by announcing that it will seek to DOUBLE Japan's monetary base over the next 2 years that amounts to INFLATING the already QE drenched money supply by an additional £1 trillion, flooding the economy with new money through the mechanisms of mainly buying liquid assets such government & corporate bonds, stocks and sector funds such as the property sector. As an comparison Japan is now printing money at a rate that is more than DOUBLE that of the U.S. which equates to 1% of GDP per month, which converts into potential EXTRA inflation of 12% per annum! Much of which will leak out of Japan and into other world economies. 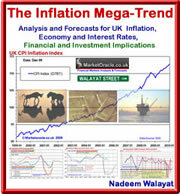 The effect of printing money is the same whether it's in Japanese Yen, British Pounds or US Dollar, and that effect is to inflate asset prices that are leveraged to inflation whilst increasing the rate of free fall of the currency against other fiat currencies which are also in a perpetual state of free fall as all governments are engaged in the same policies of competitive money and debt printing to bribe their respective voters with. I am going to end this with a very important message. We have seen that gold and silver are very probably completing Head-and-Shoulders bottom reversals, with prices having dropped down to suspected Right Shoulder low buy spots. In addition, and most importantly, we have seen for ourselves in this update the insane undervaluation of stocks relative to bullion, which is characteristic of a major sector bottom. What this means is that you can go ahead and buy large and mid-cap gold stocks now, and juniors with strong balance sheets that are either producers or close to production, with confidence, and quit worrying about day to day price movements afterwards, because you know that you are buying either at or very close to a major low. So rather than buy the sector and then sit on the edge of your chair biting your nails as you staring at changing prices on the screen, do what Smart Money does, buy them, bank them, and then go fishing or playing golf or whatever you enjoy doing with your leisure time, confident that you have bought stocks that are ludicrously undervalued and that it is only a matter of time before they rally to become more fairly valued. Your analyst wishing everyone a happy and prosperous new year.